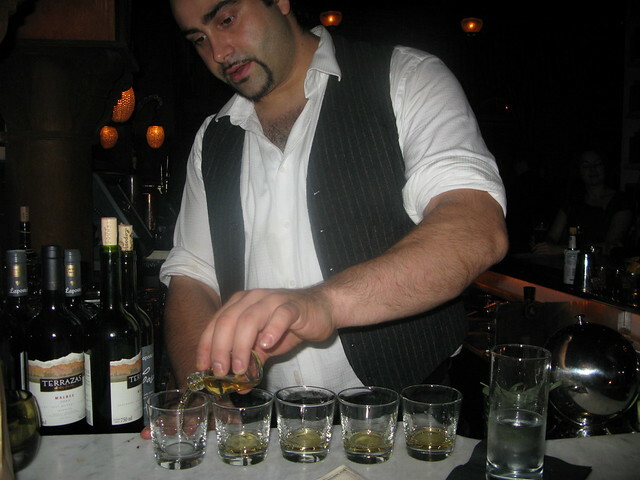 Alex Straus of Hemingway's Lounge pouring many shots. Looking around Hemingway’s Lounge, a new Hollywood bar marked by high ceilings, floor-to-ceiling bookshelves, wall of old typewriters, and artwork, I half expect the big guy himself to be sitting at one end of the bar mumbling and nursing a daiquiri (recipe for the Papa Dobles, a daiquiri created for and named after Papa Hemingway). But, no, on a Thursday night the bar, which took over the old Ivar space, is filled with fashionistas, artists and Industry types. A red velvet rope and a couple of burly security guards guarding the entrance on Hollywood Boulevard don’t enforce a dress code but there is an “attitude code,” aka no drunk guys. Young Hemingway would have been able to breeze in here with F. Scott and Zelda for sure. Old Hemingway? Not so much. This gorgeous ode of a cocktail bar to writer Ernest Hemingway was created by clubby bar impresario Johnny Zander (The Green Door, Teddy’s and Tropicana Bar), himself a huge fan of the man. And, if you never really appreciated Ernie’s works before, you will now that the menu offers not only his Death in the Afternoon champagne cocktail (made with blackberries and sour) and Hemingway’s Daiquiri but cocktails named after his masterpieces like “The Sun Also Rises” and “For Whom the Bell Tolls.” Bartender Alex Straus, you may remember him from the Table 20 contest back in September, created the drink menu making sure the cocktail names suit the cocktails themselves. Not to say he’s going for that marlin taste with the Old Man and the Sea but that the location of the story will inspire the ingredients of the cocktail. However, this naming convention doesn’t really apply to his new winter cocktail menu but, honestly, who cares? Certainly not me or my drinking companions that night, Thirsty in LA, EstarLA and Social Domain LA. We were invited by Alex to come check out the three new winter drinks when we also managed to enjoy one of the best Manhattans I’ve ever had, along with various shots of unusual spirits and spontaneous cocktails. All drinks were comped. Whiskey Warmer: My favorite cold remedy. John: A hot drink on a cool night was a good start to this booze tasting, warm, inviting with a bit of kick from the cinnamon and a strong backbone from the ample Elijah Craig 12. There’s a lot going on here with the St. Elizabeth Allspice Dram mixing it up with a bit of Grade B maple syrup and lemon. This is one of those cocktails that tastes its best when it’s the first cocktail of the night after dealing with the insanity of parking in Hollywood. Me: I almost want to catch a cold just so I can nurse it with this hot whiskey drink which is basically a sweet hot toddy. Not too lemony. 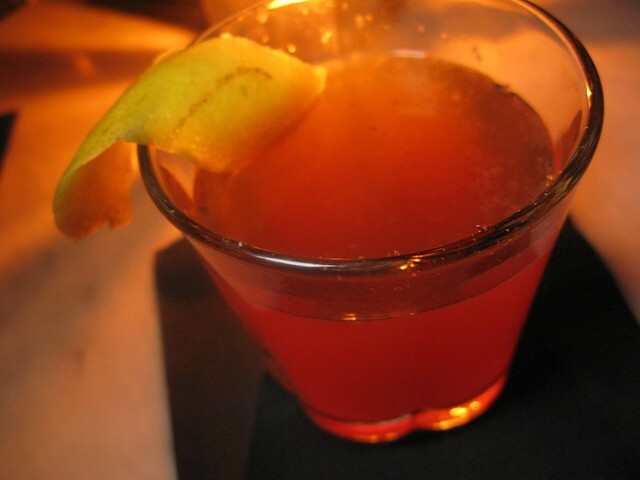 Soothes the throat and definitely the soul during one of the many bone-chilling nights in L.A. Interesting that Alex serves it in a glass without handles but I guess that makes it all the more perfect for keeping your hands warm. Hemingway's Nog: Tastiest nog there ever was. John: This is clean expressive Christmas in a glass. 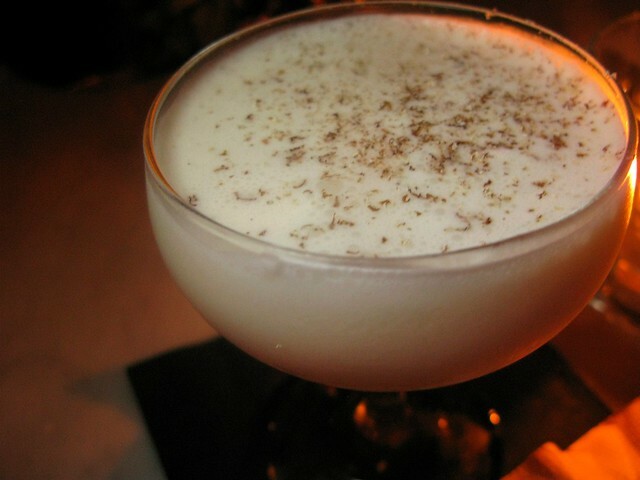 A little foamy creme fraiche on top dusted with nutmeg gives this rummed-up classic just the right kick. There is none of that cloying stickiness here. I went with two of these, and could have easily had more. Me: Dare I say, the best nog I’ve ever had? Yes, this night was full of superlatives but I don’t think I’m exaggerating here. The creme fraiche in place of egg make this a light and dangerously drinkable nog. As John said, I could easily have put away more than the two I ended up having. It finished sweet and wasn’t rich at all as most nogs tend to be. 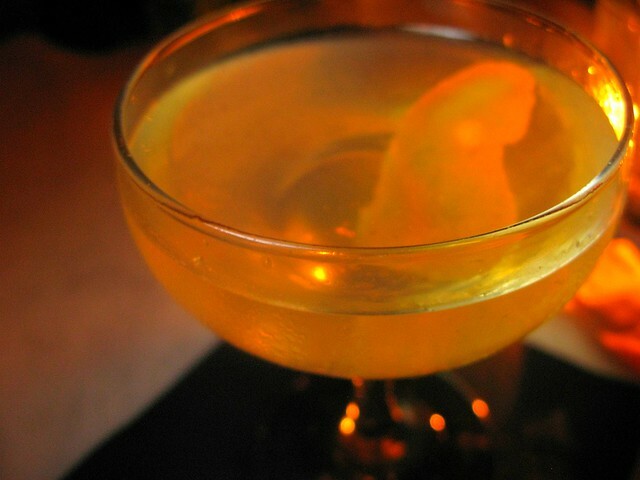 Chamomile Gin Martini: Soothing, calm cocktail. John: This is the light, midcourse palate pleaser. As the Junipero Gin is infused with the chamomile and not just simply added, you get a better, fuller, more integrated taste. The orange peel expertly flared with a Bic arrives draped across the rim, but should it topple in, do not let it overstay its welcome as it will overpower the feminine chamomile. I eagerly did two of these, but more than two would have been too much. Me: This starts off with the edginess of the gin then smoothens out and sweetens up. The chamomile makes a very subtle appearance, perfuming it a bit and evoking that calming cup of tea you have late at night when you can’t sleep. It’s surprisingly not harsh for a gin martini. 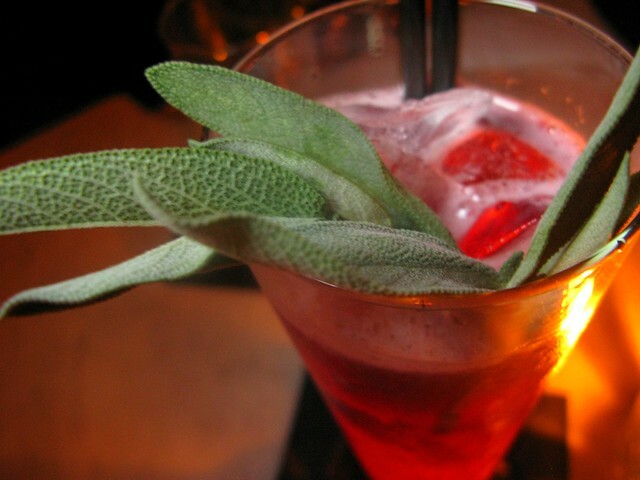 Something that straight gin drinkers may find too tame, but those afraid of gin will love it. We also tried one of the standard cocktails, the Movable Feast, which is the only rye cocktail on the menu. Also made with sage, honey, lemon and Bon Vivant’s gold rush bitters, John thought it was “fun in a glass” and “luckily not sweet” while I appreciated its subtle taste of sage in the beginning but lamented that when the sprig wasn’t removed right away, the cocktail tasted Christmas tree-ish. Movable Feast: Not on the winter menu but still festive. However, it was Alex’s Manhattan, made with Whistlepig Rye, Carpano Antica Formula and bitters, that stayed our yearnings for more cocktails. Perfect as it was, we had no problem ending our night at Hemingway’s Lounge with this bit of heaven in a cocktail glass. Whistlepig, a new 100-proof rye created by former Maker’s Mark master distiller Dave Pickerell, is the talk of the whiskey world and when incorporated into a Manhattan it succeeded in adding even more depth and character to this, my favorite cocktail. John, a big-time Manhattan drinker himself boldly claimed, “This is easily in the top 5 Manhattans in Los Angeles.” And I would have to concur. It has set the bar pretty high and ruined me for all other Manhattans. I really can’t wait to come back, preferably on an off night like Tuesday or Wednesday or even before 9 on Thursdays when the crowd is a bit sparse and mellow, the lights aren’t so dim and I can grab a seat at the bar to chat with Alex. Thirsty, Estar, Social and I are thinking of claiming that corner of the bar and making Hemingway’s our own modern-day salon, except with bloggers. The plaque is at the engraver, as we speak. Thanks! Let’s do it! I wanna get back to 1886, too.